Most of the non-blogger men that I know in Second Life don’t change their look too often. They don’t really have to. They can put together a couple of casual looks, a formal look, and that can get them through most things. The funny part is that some of them didn’t even really put those looks together themselves – they had a partner to do it! My own SL husband is not really an exception to this. Oh, he loves to shop. When we first met, he had a lot of outfits and costumes and even did some modeling here and there. But when mesh came out, and mesh bodies in particular, things got a little harder. It was like that for a ton of people, by the way. Go to any live show or older club in SL and you’ll find a lot of people who simply can’t get down with mesh and utterly refuse to even entertain the possibility. To them, mesh is still a passing phase, despite the fact that we’ve had it since 2011. Luckily, Aldwyn doesn’t go THAT far! I’d never stand for it! But since January 2016, he’s looked like this. Now don’t get me wrong. This is a good look! He wore the Catwa Jackson head with the Hugh skin applier from The Skinnery. And I’m a fan of older men, so you know I was totally into it! But there are some problems with looking older in Second Life that we didn’t anticipate when putting together this look. The main one being…it’s freaking hard to dress an older guy!! Seriously, go take a look at basically every men’s store in SL. The clothes are generally geared towards guys who are under 35 years old. Unless he wanted to wear a suit all of the time (which I wasn’t against, tbh) there were very few options for someone who looks 50+. And add that to the fact that the more “trendy” pieces like the ugly dropped crotch diaper pants and oversized tank tops that reach the knees were/are at every event and we hate that look… well, dressing was not all that fun. When LeLutka came out with the Andrea head for men, I was into it. 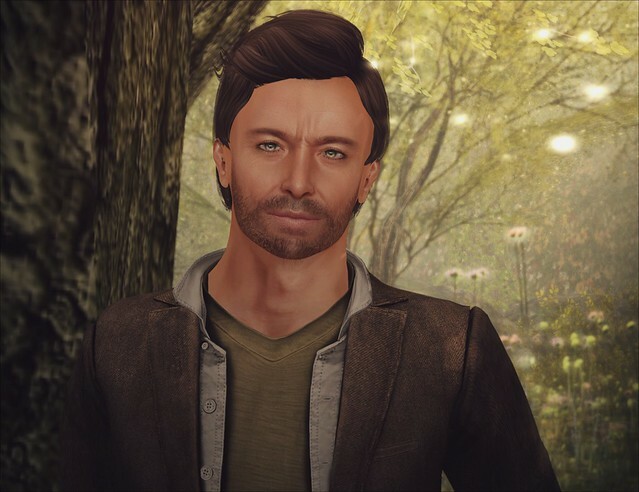 I knew I wanted to take Aldwyn younger again, because I tend to look a bit younger in SL and while I’m still into older men, I thought maybe it was time for both of us to look near the same age again. Plus, his head was not bento, and if I’m going to be bento, he’s going to be bento because that’s just the way it works. Not to mention, I adore the LeLutka HUD so so so much more than the Catwa HUDs for their heads, and I knew he would like it, too. I created his shape myself based off of what he already had, but just made adjustments to his head to keep the bento head from looking like the mouth had collapsed in on itself. I’ve found that this is the case with most bento heads. So the grand total for everything… 6380L, or about $27 USD. I did take him to get a few clothing items, too, and oh my gosh. It’s so much easier to dress him with a younger face. Well, except for the fact that people are starting to only create for the Signature and Belleza bodies, and not for Slink. But that’s a struggle for another day. If you didn’t know, I’m doing Vlogmas! If you want to see me taking Aldwyn’s avatar to get his makeover, along with looking at a couple of Advent gifts and dealing with some Christmas “decorations” that Groves left for us, feel free to watch! So this has been kind of a cool week for me. 🙂 I have actually been chatting with people who watch my videos! That was an unexpected side effect of doing YouTube. *laughs* I want to do another video kind of just chatting about that, so I’ll save my thoughts for another day. But it’s been cool, most definitely. Another thing is that I’ve gotten some wonderful feedback on my post about family! I kind of didn’t expect that either! People can be super judgmental about something they don’t quite understand or aren’t interested in, so it’s been great getting comments and IMs and stuff about it. So today I’ve just been relaxing in SL [because lord, it is HOT outside in RL and I can’t even with that right now]. Luckily in SL, I can relax and enjoy the day and not fry to a crisp. So Kate asked what I thought about virtual pregnancies. Honestly, I think what you want to do in your SL is your business. For me personally, it’s not something I’m interested in, but I truly understand people who do them. I mentioned my friend Renee in my post about family. She was one of those people who went through a virtual pregnancy because in her real life, there was no way she could possibly get pregnant. She wanted to experience some form of motherhood and pregnancy, so that’s what she did and she enjoyed it. Again, I think that is probably one of the best uses of SL – doing things that you truly want and would never ever get to experience in the RL. Now I know that when people think of virtual pregnancy, they think of 2 things. One, those dang tummy talkers that yell at you if you bump the mom, or let the whole world know when your baby wants you to eat your vitamin or is swelling your ankles. Trust me, I’m just as annoyed by those as anyone else. *laughs* And two, they think of prim babies, like the Zooby babies. And for a lot of people, that’s as far as it goes. But there is another side to the virtual pregnancies that, if you’re not in the family community, you might not know about. It’s not uncommon for parents who have adopted kids in SL to later “birth” the child. No, not like… no, not like you’re thinking. LOL! I know what you’re thinking. But the mother goes through the traditional virtual pregnancy knowing that at the end, the “baby” is their adopted child. It’s more symbolic than anything else. Once the child is born, they are no longer considered an adopted child, but instead are considered a true born child. Actually, our friends Jill and Gattz have done this with all of their kids, and you can read about Jill’s last pregnancy on their blog here. Like I said, it’s more symbolic than anything else, although I think most of the people who do this do get a Zooby baby named after the child. Now would I “birth” Abby and Birdy? Uhh… probably not. *laughs* I mean, if it was something they truly needed, I would do it. I understand the meaning behind it. But I don’t really have an interest. But for real. Turn your stupid tummy talker off. No one wants to hear it. Over the past few years, I’ve done posts here and there, either for Memorial Day or Veterans Day, thanking those who have served in the armed forces. Two of my high school classmates, Robert and Billy, died while in service. One in Iraq, one in Afghanistan. My nephew is currently in the army. Another young cousin is planning on enlisting in the air force after he graduates in 2017. With everything going on in the world, it’s hard to think of what their military careers will be like. But they know what they are signing up for. They are, or are going to be, soldiers. But then I think about the people caught in the crossfire. What happened yesterday is a good example. However, it would be too easy to give into fear. I know we’re all scared. Anything could happen. I spent an hour on the phone with my mom earlier reassuring her that we’ll be safe. It’s a promise I can’t exactly keep, of course. We both know that. But it made us feel better. And as we are people of great faith, we prayed about it. It would be too easy to look at the news and be scared and hide in the bed. So I’m doing as Mr. Rogers said his mom told him to do when things are scary. I’ve been looking for the helpers. And oh, are there helpers! So many people opened their doors last night to strangers in need. People reached out to help in any way that they were able. It was beautiful to see in the wake of so much tragedy. Our Heritage panel expired yesterday. I thought it wasn’t time yet, but they do expire after 20 days and after counting back, yep, it was the 20th day. Now, granted, we are picky. Anyone who reads our own panel notecard will see that. We have certain things that we look for in a family member. You SHOULD be picky when going into this. I’ll say that again. You should absolutely be picky about who you are choosing to go on trial with. That being said, it amazes me that people wouldn’t put their best foot forward while writing out their applications. So here are a few things that make ME immediately delete an application that I’ve read. It might be of some help to you if you are looking to be adopted and are having problems getting your panel Liked. Now these are just my opinions. Some families might not care about any of this, some might care about all this and a whole lot more besides. But this is just how it is for me. 1. You have written NOTHING. No. Seriously. You have to fill out the application. Just throwing the app in the panel without even your name is not going to do you or anyone else any good. My favorite was the kid with the almost blank notecard. All it said was “Please talk to me.” No name, no information. Nothing. 2. You haven’t written anything that lets anyone get to know you. The application has a lot of very straight forward questions on it. What is your name, how old is your RP age, when are you online, etc. But it also has questions that can let your personality come out a little, especially in the freestyle area where you can kind of talk a bit more about what you like and what you’re looking for. 1 out of 5 applications I’ve read, this area has been left blank. 3. You have way too much backstory. Some people are much bigger roleplayers than I am and I get that. But I feel like there are some kids out there who write too much “story” about their life prior to Heritage and it’s almost a bit weird. But, again, there are families out there who are a 10 on the RP scale and want to know NOTHING else about your outside life. But I’d say the average family doesn’t require a huge story about how you ended up at Heritage in the first place. 4. You don’t really know who you are. When we first met Abby, she told us she was 8. She felt 8. She IS 8 in SL. When we met Birdy, she said she was 7, but felt she could go slightly younger or older. I feel like [and she can correct me on this!] that it’s because she came from a heavier roleplaying background and sometimes you change to fit a story. But around her first adoptaversary, she settled in at 5, and 5 seems to fit her very well. Some of these kids on their apps say that they can be “2-15.” Or they have 12 different avatars where they’re “2, or 6, or 13, or 16, or 27” on any given day. And even worse, they write their application as a 4 year old, then slip in that by adopting them, you’re adopting their 17 alts that are all different ages from 18 months to 48 years old. No thanks. 5. I can’t understand a dang thing you just wrote. Look, I get it. Kids don’t always speak correctly. Changing a few words here and there is endearing. Writing an entire notecard in crazy “baby talk” is NOT endearing. If every question “are answordeds wike dis becuz mees is fwees years olds an ebberyting is wonnerfuls,” I’m going to delete your card and not look back. And this isn’t really a dealbreaker or anything, but just a suggestion. Get a good photo for your panel. I know, I know. Don’t judge a book by its cover. But who picks up a raggedy, boring looking book? A lot of the panel pics are the kid basically just standing there at Heritage. You don’t need the most professional photo in the world, but a nice, clean picture will draw someone’s eye to your panel. If you don’t have a computer that takes nice pics or the ability to figure out what looks good, there are a lot of people who will take a nice photo for you. Heck, IM me. I’ll do you up a quick panel picture in less than 10 minutes if I have the time. Next up – Parent Applications. Lord, if you thought the children were bad…. If you came here looking for my post on the demo skin and the Photoshopped ad, I took it down. Not because I was pressured to, because if you know me, you know I would have kept it up and posted it EVERY-FREAKIN-WHERE if I’d been told to take it down. *laughs* But I took it down because I feel like people, including the creator of the ad itself, missed the point I was trying to make entirely. If you are a creator and you sell your items for money, you owe it to your customers to not do false advertising. As pretty as you can make an ad with Photoshop and filters and morphing, you are doing a GREAT disservice to your customers AND to your brand by making a completely fancy ad that looks absolutely nothing like what you’re selling. Although some people showed me how they looked in the exact same skin and shape that I demoed, they did not look like the girl in the ad for that particular skin and shape. They did not, and I think they could agree with that. The creator of the ad IMed me and told me that yes, she draws digitally using a tablet. And that’s cool. I thought she actually did a pretty decent job. She was hired to do something and this is not her fault that what’s in the box is not really on the ad. When you put something up for sale and you expect to be given money for it, the person giving you that money expects to get the right item. This is why vendor ads in SL should not be overly photoshopped. It’s why, in my opinion, bloggers should not do too much photoshopping if they have gotten an item for review. If you digitally retouch an item until it no longer looks like it does in world, you need to put a disclaimer that that is what you did. Otherwise, you are cheating people who expect that item to look just like it does in your photo. And let’s remember that a great many bloggers and creators have higher end computers that support ultra graphics, but the every day Second Lifer may not and things don’t always look even half as good to them. I do Photoshop my blog photos, as most bloggers do, but never to alter the item in a huge way. AND – and let me make this very very clear – if there is a demo available, you NEED TO DEMO. I have been burned many times by not taking 5 minutes to demo an item before buying it and then being disappointed when it does not meet my expectations. Had I wanted to look just like the ad in question, I would have been severely disappointed if I’d not demoed the skin and shape beforehand. And long time SLers know this. But someone new to the grid may not, and those are the people that you as a creator want to grab. Long time SLers have their faves already that they are dedicated to. Newcomers are still deciding who their faves are. You want to grab them and sway the long time people to your brand. Having your ads photoshopped to death and back is not the way to do this. Anyway, I didn’t expect my post to be so controversial. 🙂 This is a personal SL blog, it’s not on any feeds, and the skins were just something we were joking about on Plurk on Sunday. I kind of didn’t expect more than a few people to read my post, so I was pretty surprised to see that it got as many views as it did. And I know many people went down to the store to check out the demo for themselves, so all publicity is good publicity, am I right? So TL;DR version? False advertising = Bad. Demoing = Good.